The CSR content on our website, in combination with the CSR section in our Annual Report, serves as a record of our main CSR (workplace, environmental and community) initiatives and performance, focusing on areas that are material to our business and stakeholders. Our CSR reporting follows the Hong Kong Stock Exchange's Environmental, Social and Governance (ESG) Reporting Guide which has been added to the Listing Rules as a recommended best practice. Our reporting also draws on the guidelines and principles of the International Integrated Reporting Council's International <IR> Framework, the United Nations' Global Compact and GRI. 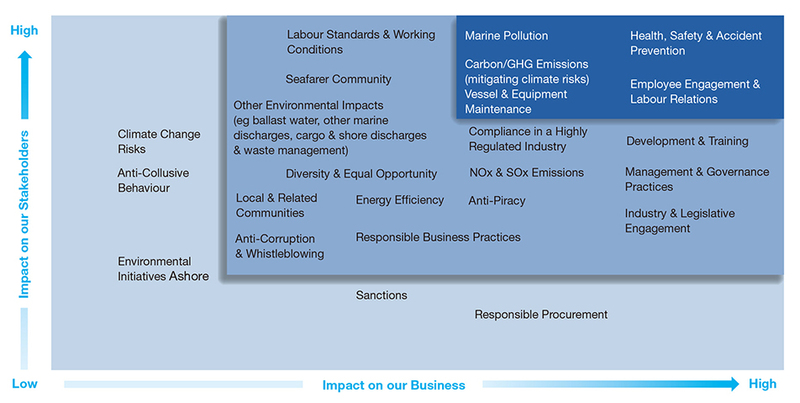 The scope of the report covers environment, workplace and community initiatives that reduce our environmental impact, reinforce our class-leading safety culture and mitigate safety and environmental risks, enhance job fulfilment and promote responsible engagement within the communities where we operate. Our CSR reporting focuses on the majority portion of our fleet which comprises owned and any finance-leased vessels that we control both commercially and technically. It is these vessels over which we have the authority to mandate and control Safety, Quality, Health and Environment (SQH&E) policies and actions. We also report on company-wide staff engagement initiatives and performance. Our Energy Efficiency Operational Indicator (EEOI) and other environmental and safety KPI data has been measured or calculated in accordance with industry standards, and has been audited by DNV GL Business Assurance for ISO9001, ISO14001 and OHSAS18001 certification. The Board is responsible among other things for the development of our long-term corporate strategies and broad policies. In setting our standards, it considers the needs and requirements of the business, its stakeholders and the Corporate Governance Code and ESG Reporting Guide encompassed in the Stock Exchange’s Rules Governing the Listing of Securities on The Stock Exchange. As such, the Board has overall responsibility for, and is engaged in, our CSR strategy and reporting, including evaluating and determining CSR-related risks, and ensuring appropriate and effective CSR risk management and internal control systems are in place. Management provides confirmation to the Board of the effectiveness of these systems. The Board delegates to the Audit Committee (comprising all six Independent Non-executive Directors) more specific responsibility for reviewing the effectiveness of the Group’s internal control and risk management systems, and reviewing the work of the Risk Management Committee. In turn, our Risk Management Committee (comprising our CEO, CFO, Company Secretary, and Risk and Internal Audit Manager), reporting to the Audit Committee, is responsible for assessing and enhancing the Group’s risk management, as well as CSR and corporate governance policies, strategies and performance. The Chief Executive Officer is delegated responsibility by the Board for executing our corporate sustainability strategy and initiatives. In turn, his direct reports across the Group have functional responsibility for sustainable business practice in specific areas, most notably our Fleet Director and the senior managers of our Fleet Management division (covering technical operations, fleet personnel and risk, safety & security) and our Human Resources and Administration department. We assess all the matters that are material to the long-term success of Pacific Basin and the sustainable growth of our business and operations. This exercise – an analysis of opportunities and risks and how to balance them – also assists us in developing and achieving our strategic objectives. Sustainability is a key element of each of these material matters, and this is the driving force behind our long-term progress and success. Through this process, we have identified the material matters below which are key components of our business model and key drivers of our Group’s performance and long-term viability. the extent to which a matter is likely to grow in significance and impact in the future. Pacific Basin engages in active two-way dialogue with our stakeholders – primarily customers, suppliers, employees, shareholders, financiers, industry associations and regulators. This enables us to map issues that are of greatest importance to our business and stakeholders, and determine the key matters for discussion in our CSR reporting. In addition to our day-to-day contact with customers, we conduct regular and in-depth customer and investor surveys that provide insight about our operations and ways we can improve. We also engage actively with associations that work to influence and respond to regulations that affect our industry. We measure and report key performance indicators (KPIs) across our environmental and workplace performance. Through the reporting of these KPIs and information in our CSR Report, we disclose each element deemed to be of greatest impact to our business and stakeholders. Pacific Basin operations are subject to the Group's internal rules and regulations as well as the prevailing legislations, rules and codes imposed or recommended by the relevant regulatory bodies from time to time, such as The Stock Exchange of the Hong Kong Limited, the Companies Registry, etc.